Once the portal has been configured to enable auditing, a user can view the audit history of all entities, such as folders, documents, or tasks. To view an audit history for an entity, select the entity in the folder data panel, or the entity's Actions menu, and select Manage > See Audit History	in the bottom right. 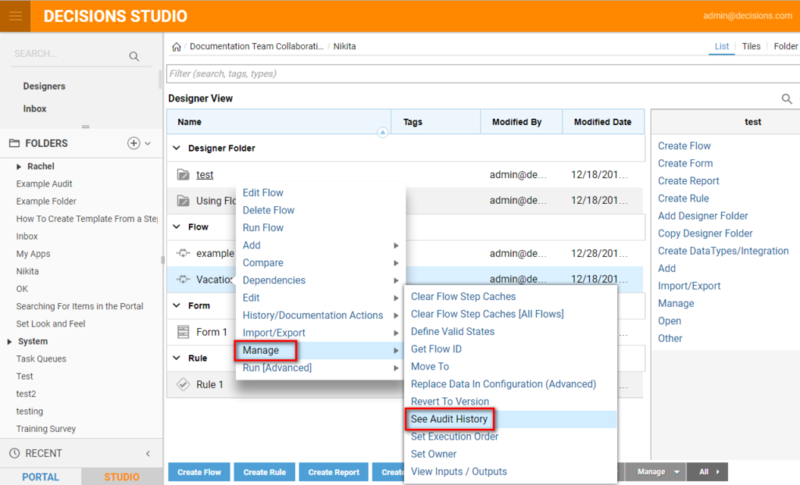 This example will look at the audit history for a flow. Begin by navigating to a Designer Projects folder where a flow having more than one saved edit resides. From the Action	menu on the thumbnail, select Manage > See Audit History	. Account Email Equals - Filters based on user who made the change. Notes Contains - Filters based on specific text in notes upon saving the entity. Type of Change Equals - Filters based upon whether the entity was inserted, updated, viewed, or deleted.